Zebronics, India’s leading supplier of IT peripherals, Audio/Video and Surveillance launches its flagship tower speaker, ‘Hard Rock 1’ which does not just look stunning but also understands the speech of thunderous sound, LOUD-sound. Exemplifying the true beauty, paired with multi-functional features, Hard Rock 1 redefines the meaning of true Sound, elevating your sound experience to the next level! The Speaker delivers premium sound through set of quad low range drivers, dual mid-range drivers and dual tweeters, offering sound without distortion. Hard Rock 1 comes with built-in audio crossover, its three-way acoustic design, each tower speaker unit has Dual 20cms low range driver, 10 cms mid-range driver and 2 cms tweeter, helps to fill your room with a clear, powerful sound and give you a boombastic time. Designed for music and movie enthusiasts looking for that edge of innovation, the Tower Speaker is housed in full wooden enclosure designed for rich immersive music experience and a high-end matte finish, that complements your décor and adds style to any room. It’s available in Dazzling white/silver and black/gold colors along with the LED Display, experience good sound with good looks. With circular Control pod at the top and bundled dual wireless mics for the endless karoke night, you can connect two more wired mics, the speaker is further engineered for seamless multi-functional usage. 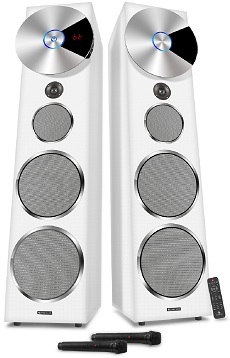 The Speakers are the best to configure with any Bluetooth enabled device. It can be easily connected to your Computer, TV, DTH or bluray player to listen to audio from any of the sources. It also includes a USB port and an SD/MMC card slot along with the fully functional Remote Control for the ease of functions, wherein you also have advantage of controlling the speaker from anywhere in the room. Enjoy your music and movies better with Zebronics Hardrock 1, already available in leading retail stores across India.